As machines and systems become more modular and control cabinets smaller, the space requirements of control components are increasingly scrutinised. At the same time, ever more complex and sophisticated machines require more computing performance. However, there are also more cost pressures in the field of automation. In order to meet all these requirements, Beckhoff has developed a new series of ultra-compact Industrial PCs (IPCs) – starting with the C6015 and leading to the high-end C6030. 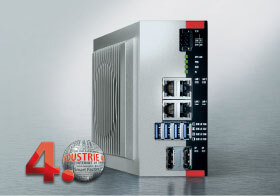 These devices are ideal for a broad range of applications, including environments with decentralised architectures and today’s IIoT and Industrie 4.0 applications. The new series of ultra-compact IPCs premiered with the C6015 at the 2016 SPS IPC Drives trade show in Nuremberg. Equipped with an Intel Atom CPU, it is well-suited for all kinds of automation, visualisation and communication tasks in the medium performance range. Measuring only 82 x 82 x 40 mm, the ultra-compact and industrial-strength multi-core IPC is only one-third the size of the C6905, previously the smallest control cabinet IPC in the Beckhoff portfolio. With price savings of approximately 25 percent, the C6015 ranks far below the previously lowest-cost x86 IPCs from Beckhoff. With exceptional installation flexibility, it also opens the door to application areas that were previously closed to IPC technology because of cost or space limitations. • The most important and obvious feature of the C6015 is the extremely compact size that does not compromise suitability for industrial applications. This is underscored by a design with passive cooling and long-term availability in a robust aluminium and zinc die-cast housing. It also meets all other industrial requirements, such as an expanded temperature range from 0 to 55°C and exceptional vibration and shock resistance. • Combining high computing power with low energy consumption, the C6015 leverages Intel Atom CPUs with up to four cores, providing the ideal basis to handle all applications in the low to medium performance range. • The exceptionally flexible installation concept permits vertical or horizontal back wall installation in control cabinets. Moreover, with its symmetrical cooling fins, the C6015 can be positioned freely within the mounting frame. Features like these and the free orientation of the connector level, with all connectors on a single side, allow a wide range of installation scenarios that accommodate all incoming cable feeds in even the smallest spaces. In the past, this was often impossible, precluding the use of an industrial PC in certain machine designs. • The features and interfaces of the C6015 are also designed for a wide range of applications with a 30 GB M.2 SSD, 2 GB of DDR3L RAM (expandable to 4 GB), one DisplayPort, one onboard dual Ethernet adaptor with 2 x 100/1000Base-T connectors, one USB 3.0 port, and one USB 2.0 port. Overall, the C6015 is likely the first IPC on the market to offer such a high-performance density paired with all the interfaces needed in machine design. Beyond its typical use case as control hardware for automation and visualisation tasks, the success of the C6015 is also largely based on IoT applications. About half of the devices installed to-date are being used for communications purposes in IoT applications. These may include something as simple as the collection, processing and provision of process data or more complex tasks that are typical of an IoT gateway. The Microsoft Azure certification of the C6015 underscores that it is an ideal device for Industrie 4.0 applications. The C6015 is well-matched for such communication tasks, including connectivity with legacy systems, because it makes it easy to add IoT capabilities to existing machines and get them ready for future communication requirements, either as an IoT gateway or a basic data collection device. Beckhoff is continuously adding models to its family of ultra-compact and flexible industrial PCs. At the 2017 SPS IPC Drives trade show, for example, the company unveiled the high-end C6030 with processors from the most advanced performance class. This is because the innovative concept introduced with the C6015 also quickly impressed users with automation, visualisation and communication applications who have requirements that go beyond the medium performance range. 132 x 132 x 67 millimetres, the computer is nearly half the size of the closest comparable C6930 control cabinet IPC. The C6030 also offers more standard interfaces even in the basic configuration: an onboard Ethernet adaptor with four 100/1000Base-T connectors, four USB 3.0 ports, and two DisplayPorts. It also features two easily accessible slots for M.2 SSD drives (incl. RAID). Depending on the selected configuration, the C6030 costs up to 34 percent less than a comparable IPC from the C69xx family. With processors ranging up to the Intel Core i7 with four cores running at 3.6 GHz and the Core i3 with two cores running at 3.9 GHz, the C6030 delivers what may be an unprecedented level of performance in such a compact format. 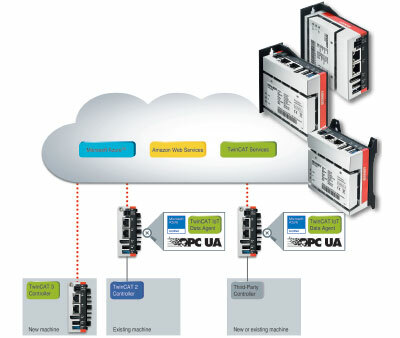 As a result, the successful concept of ultra-compact Beckhoff IPCs has now become available even for very large and complex machine control applications. This can include CNC, XTS and HMI applications, multi-axis control, as well as applications with extremely short cycle times and large data volumes. For legacy equipment, the C6030 can serve as a powerful replacement in control platform retrofits and go well beyond the capabilities of alternate systems. With such a high level of performance, the C6030 can easily handle all machine automation and visualisation tasks as well as all IoT operations. Just like the C6015, the user benefits from an exceptionally flexible installation concept with vertical and horizontal back wall mounting and totally free positioning of the IPC within the mounting frame.